The popular uprising in Egypt gave Washington a bit of a headache; Mubarak had been an ally for three decades. A moderate leader at peace with the Israelis despite being somewhat repressive in his own land. But how could the most free nation on the planet continue supporting him with one hand while professing to support the universal rights being demanded by the protesters in Cairo? The answer was - it couldn't - and Mubarak was "let go" seeing as the Egyptian army could probably maintain the country on it's moderate path, keeping peace with Israel and begin to address some basic reforms. Bahrain which also began to feel the waves of revolution, posed a more difficult situation for the US. Unlike Egypt a brutal crackdown was taken against protesters there. Security forces opened fire Friday on Bahrain's protesters wounding at least 50 people as thousands defied the government and marched toward Pearl Square in an uprising that sought to break the political grip of the Gulf nation's leaders. 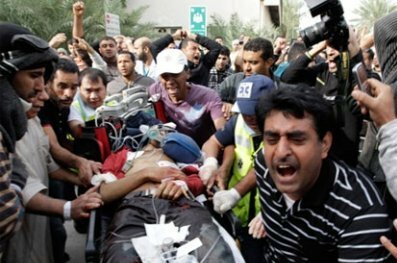 The US condemned the use of violence against protesters in Manama but chose its words very carefully. Secretary Clinton said: "Bahrain is a friend and an ally and has been for many years and while all governments have a responsibility to provide citizens with security and stability, we call [for] restraint." President Obama spoke of universal rights, but US interests hang in the balance, perhaps even more so than with Egypt. Sunni kingdoms like Bahrain and larger neighbour Saudi Arabia are allied with the US and are crucial counterweights to Iran's growing influence in the region. Bahrain itself is home to the US Navy's 5th fleet and is a key pillar for US regional military infrastructure. Thankfully, today troops have been withdrawn from confronting the mainly peaceful protesters, an jubilant demonstrators feel empowered. A dialogue has apparently begun with the ruling royal family. Critical here is not just Bahrain's image of itself as a modern, relatively liberal Middle Eastern country, but the extent of outside influence. President Obama and British Foreign Secretary William Hague, all phoned the monarchy urging a peaceful solution and it appears for now their words were heard. Or should that be threats, what with CJCS Admiral Mike Mullen being sent to the region today. Interestingly, Iran was quite quick to voice it's congratulations to the people of Egypt in achieving their goal in a peaceful manner but hypocritically violent in retaliation against Iranians protesting against them this week. The Iranian Parliament's conservative MPs even called for the execution of protest leaders. Protesters in Sanaa, Yemen marched to the Ministry of Justice, demanding President Ali Abdullah Saleh leave office immediately. Riot police shot dead a protester and injured five others when they opened fire on the thousands of demonstrators. Four others were killed by police in Aden and another lost his life in Taiz when a grenade was thrown from a car at protesters. Protesters clashed with government supporters in Jordan on Friday, where crowds had gathered to demand political reform. Police moved in to separate the groups and activists say eight protesters were hurt in the scuffles. It was the seventh week in a row that crowds have gathered after Friday prayers to urge economic and political reforms. 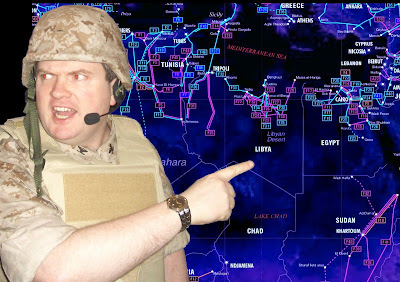 Admiral Mullen recently visited Jordan which like Egypt, has a peace treaty with Israel. Mullen assured King Abdullah II of America's commitment to the security of his kingdom. Despite the tense situations in the Middle East, nothing is comparing to the bloodbath that's currently happening in the the North African country of Libya where Colonel Gaddafi's forces have killed over 200 protesters against his 40-year regime in only a few days. Soldiers have been using heavy weapons to quell protests and even a funeral procession came under mortar fire at the weekend. Gaddafi is unlikely to respond to either political rhetoric or even military threats. To to save both his skin and his power, he's unlikely to shrink from more violence. It's doubtless he will see anything other than the harsh measures we see coming from there now as his only option. I think it's high time that the man Ronald Reagan dubbed the "mad dog of the Middle East" got put down!